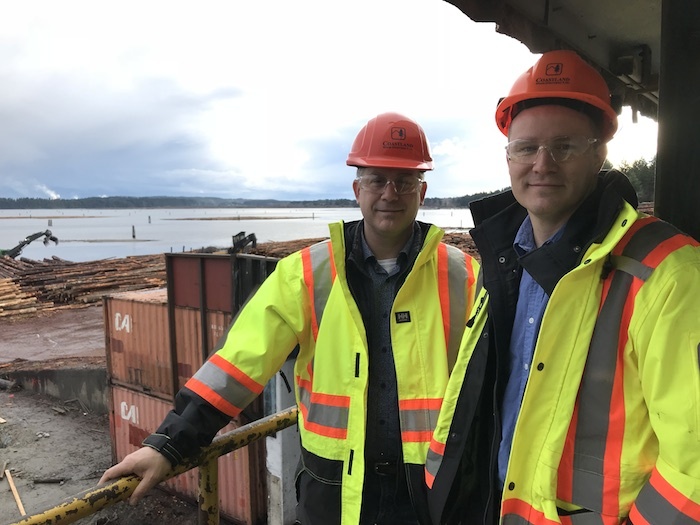 March 23, 2018 - On the picturesque shores of Vancouver Island, in the city limits of Nanaimo, B.C., a veneer and roundwood facility has been efficiently turning 100 per cent Douglas fir into quality veneer sheets since 1988. 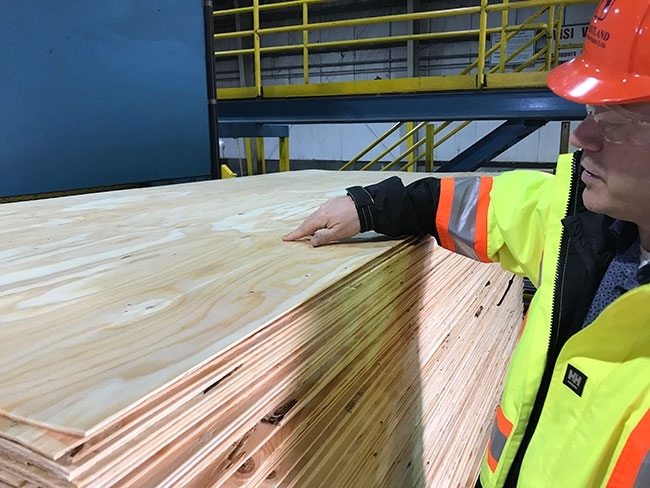 Coastland Wood Industries’ vice-president of operations Doug Pauze checks the quality of freshly processed Doug fir veneer before it heads to the strapper. 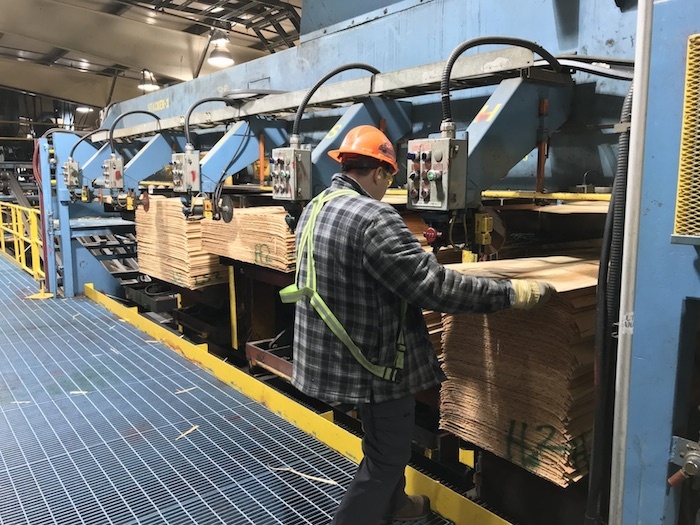 Over the past several years Coastland Wood Industries has undergone expansive capital projects, including adding a third lathe line, new scanning system, and new strapping system. A philosophy of consistent improvement and innovation has made Coastland one of the largest dedicated veneer facilities in North America. The privately owned company remains versatile to changing market conditions by designing some equipment in-house and looking overseas for new solutions. Those new ideas have included small changes like choosing the right knives for their lathe lines, to large projects such as building an in-house fence post/tree stake program, installing a Japanese-made spindleless lathe line from Meinan and upgrading their log deck with a complete system from Springer-Microtec. Owner Don McKay started the company and built the Nanaimo facility in ’88, launching production with a single COE lathe line and single log deck. In the mid ’90s, Peter Shields bought into the company. A second COE lathe line and second log manufacturing line were added in 2000, and in 2013 they installed a third lathe line. The company also operates two separate dryland sorts; Howe Sound Sort in Port Mellon and Menzies Bay Sort in Campbell River. 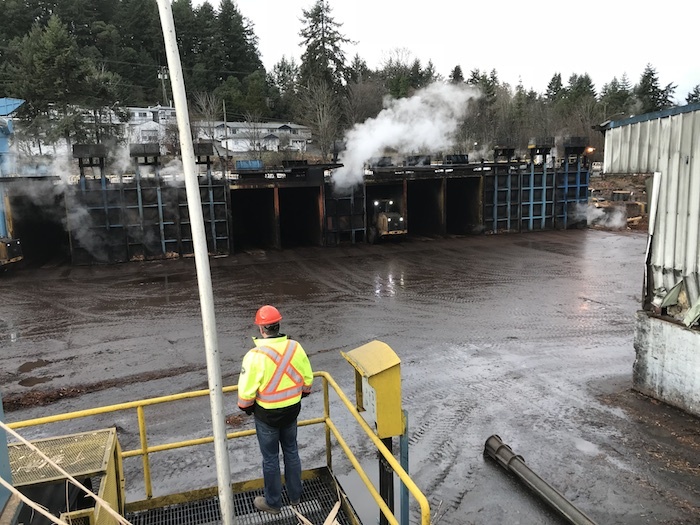 To complete the veneer peeling process, Coastland also operates a drying facility on Annacis Island in Delta, B.C., where they have three dryer lines and a fourth dryer scheduled to be online in late June of this year. In 2017 Coastland consumed just under one million cubic metres of 100 per cent Douglas fir — all sourced within a 300-kilometre radius of the Nanaimo plant — and produced about 470 million square feet of veneer on a 3/8-inch basis. Between 70 and 80 per cent of Coastland’s product is shipped to the U.S. and 15 to 20 per cent into B.C. with a small percentage heading to Asia. 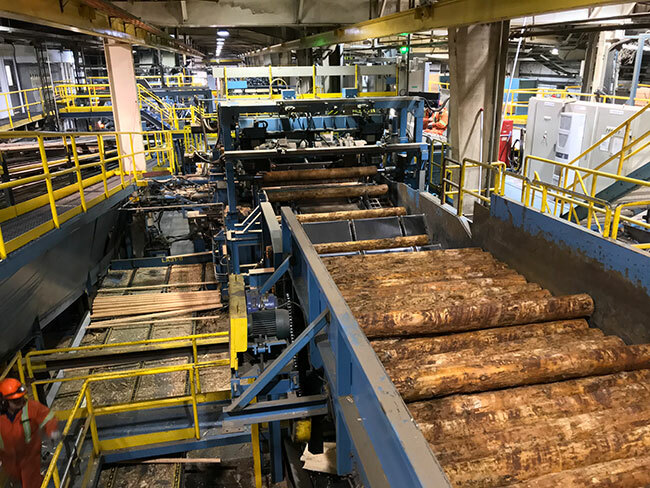 The veneer production process begins with the use of either a Wagner log loader to unload logging trucks for direct input into the mill, or a Cat 980 loader for any loose log inventory that needs to be inputted into the process. Currently, the logs enter one of two saw lines for processing to 103 inches for the peeling process. A rarely used railway line divides coastland’s 10-acre mill site, splitting the log deck from the lathe facility, which means logs must be conveyed on a trestle bridge over the railway before being sorted by diameter into three bunks of large, medium and small. This sorting process allows Coastland to efficiently run its lathes based on diameter. “We want to keep our lathes running to their most efficient levels, this means ensuring that the diameters feeding each lathe maximize that particular lathe’s output for quality and production,” Pauze says. Before heading to the lathe, logs are placed in one of 13 conditioning vats that shower them in hot water, heating the wood to a core temperature of 120 F, a 10- and 12-hour process. Conditioning softens the wood, making it easier to peel, and creating a better quality product when conditioned properly, Pauze explains. The two COE lathe lines begin with Altec XY Scanning systems, while the third line, the Meinan line, uses its own proprietary XY scanning system. The purpose of the XY scanning system is to help position the log in the lathe in the optimal position for the greatest veneer recovery and quality of peel. After each log is peeled, the sheets are graded for moisture and quality. On the original COE line through a Ventek Nv4g grading system and uses the Ventek Multipoint Diverter System to direct the veneer to the stacking systems. On the second COE lathe line, Coastland has been working with Altec on the development of a new green scanner system to grade the sheets and direct them to the stackers. Last but not least, the Meinan lathe line utilizes its own scanning technology to grade the sheets before being directed through its own diverter system to the stackers. Green veneer is barged from Nanaimo to Coastland’s drying facility in Delta. About 70 per cent of their veneer product is dried; the rest is sold in green form to customers who dry it themselves and produce products such as plywood and laminated veneer lumber. The Nanaimo facility produces 32 square foot (4×8-foot) veneer sheets, as well as fence posts and tree stakes from the cores. Coastland uses 100 per cent of the fibre that comes into the mill. “Everything we do with that log goes into a value stream,” Pauze says. Trim ends and any veneer or core that doesn’t meet quality standards form a chip pile that is sold to nearby pulp mills. The facility itself is heated by a 24MM BTU Wellons thermal oil hog-fired burner, which is powered by bark and sawdust from the log deck. Installed in 2013, the third lathe line was a huge project for Coastland that lead to a capacity increase of up to 40 per cent. The company chose Japanese manufacturer Meinan to supply the lathe, which was installed between the original two lines. A big perk of the Meinan line is that logs are only required to be conditioned for two to four hours, which saves both time and energy costs, Pauze says. “Even then we don’t have to condition the logs, we can peel it cold, but the quality of the peel is a much superior when you heat it up,” he says. The Meinan line is a spindleless system, which essentially means the lathe uses spiked discs to drive and peel a log. The result, Pauze says, is slicing fibres instead of tearing them, creating a smoother, more consistent quality of peel. In 2017, Coastland upgraded its strapping system to a first-of-its kind model from Itipack. Built at their main factory in Italy, the system automatically places both top and bottom dunnage, and requires just one operator. In 2016, Coastland upgraded its No. 1 veneer line with a Ventek (now USNR) Nv4g scanning system, catch-up tray controls, clipper controls and the Ventek MPDS diverter. “It was the best investment we’ve made in a long time,” Pauze says. “The most difficult part was just getting the equipment in here because we don’t have a lot of room.” Installation involved cutting a hole in the roof of the facility to drop the equipment in place. An unexpected benefit is a new sunroof that lets the sun heat the facility in the winter and heat escape from the roof in the summer. This winter Coastland began a complete retrofit of its log deck line, choosing to install the first complete Springer-Microtec system in North America. The new log deck is the costliest capital project the company has undergone since 2000. “The concern I had with this is will it be robust enough? Being built in Europe, the thought was it won’t be built as strong and sturdy for our needs, but that couldn’t be further from the truth. The way it’s built is very strong and the maintenance costs are very low because there is no banging and clashing. It’s a very simple, elegant system,” Pauze said. The new single line will run faster than the current two lines. A brand new Nicholson A8 debarker will be the natural speed bottleneck, but will still allow the line to run at 400 feet per minute. The new deck will also include two scanning systems; one is for scaling to determine volumes. Coastland is beta testing a new scaling scanning system for Microtec, which is in the process of being certified for automatic scaling with bark on. The second scanner is a 3D scanner, which is essentially a veneer prediction model. “Say I want a minimum 40 per cent veneer yield from each block to make it up to the lathes. Each log has to meet this criteria and if it doesn’t we’ll chip it. Everything going up to the lathes should meet that criteria,” Pauze says. Microtec-Springer is providing the complete log processing system for Coastland, while SKS Engineering has assisted in the layout and designed the waste system for this line. The deck should be up and running by the end of May. Coastland is dedicated to constant improvement in the quality and efficiency of their products. “One thing we pride ourselves on is innovation here. We think outside the box,” Pauze says.